I love sweet saucy chicken bites over a bed of rice, it's something I've loved ever since my parents took me to a Chinese restaurant when I was in college. Prior to then I never went with them because I didn't think I'd find anything I would like because I am insanely picky. They assured me that I would like Sesame Chicken from this place, and since I was a poor college student home for the weekend I really had no other choice unless I wanted their leftovers from before I got back to town. Well, thank you mom and dad for encouraging/forcing me to try this because I've never looked back. While Sesame Chicken certainly isn't the most authentic Chinese foods out there, it's something that I crave frequently. Again, it goes to my love of sweet/spicy saucy chicken and rice. 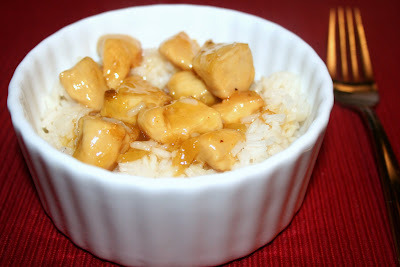 Over the last few years I've experimented with dishes similar to Sesame Chicken by varying up the flavors. My favorites are tropical flavors, such as orange chicken. One day while grocery shopping and grabbing some Worcestershire Sauce I saw a bottle of Pineapple Sauce out of the corner of my eye. Seeing that and the chicken in my cart made me want to make a Chicken in Pineapple Sauce over rice. I read the ingredients, ignored all the High Fructose Corn Syrup and decided I could make something similar at home, but add a bit of heat as well. I loved everything about this, as I knew I would, and my only complaint is that I didn't make enough for leftovers. Heat Olive Oil over medium heat, then add chicken, turning occasionally until browned on all sides (check frequently since they're small pieces). Once almost finished, add garlic to the chicken and cook about 1-minute until fragrant. Add the prepared sauce to the cooked chicken and heat through until just boiling. Reduce heat and simmer until thickened to desired consistency. If you would like to make a thinner sauce, slowly add in chicken broth until the sauce reaches desired consistency. For a thicker sauce, simmer longer. Serve with steamed rice (and some sugar snap peas or bell peppers would be great). I cant wait to try this!If you wont mind I'd love to guide Foodista readers to this post.Just add the foodista widget to the end of this post and it's all set, Thanks! Oh gosh, Sesame Chicken is my fave! And, yeah, it's really an American meal. Ha. Looks great! I love to use pineapple as a sweetener. It goes well with so many meats.